List of TimeZones supported in this Java. Source available. Add column 1 in hours to UTC (Coordinated Universal Time/Temps Universel Coordonné) to get local standard time. for the current version of TimeZones. Displays all Java-supported Timezones, the default Timezone and whether DST is in effect and the current time. 546K zip for TimeZones Java source, compiled class files, jar and documentation to run on your own machine either as an application or an Applet. access tz source in repository with [Tortoise] Subversion client on wush.net/svn/mindprod/com/mindprod/tz/. 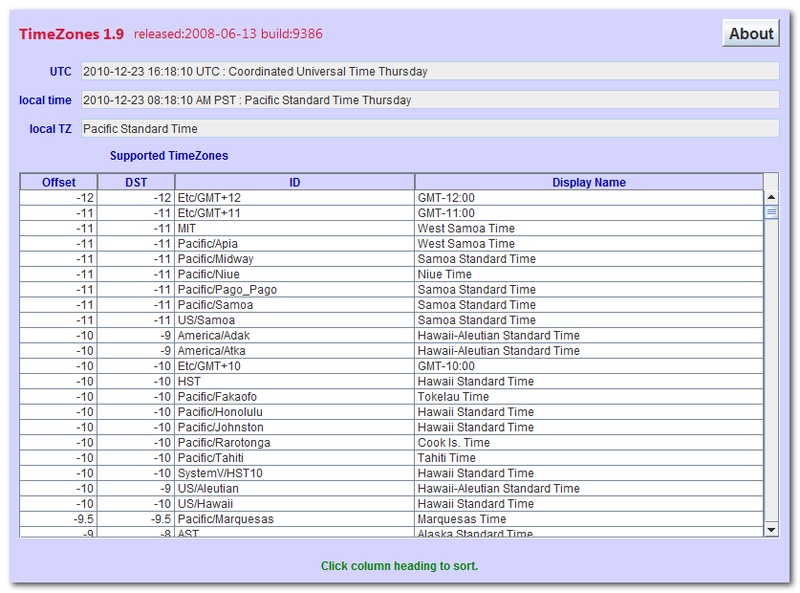 download ASP PAD XML program description for the current version of TimeZones. TimeZones is free. Full source included. You may even include the source code, modified or unmodified in free/commercial open source/proprietary programs that you write and distribute. Non-military use only.